History is an important part of our lives and an important part of appreciating who we are. History helps provide a little more meaning in our lives, and an increased appreciation of being alive and a part of the world, through connecting us into the shared memory of the human race. History helps us better appreciate just how biased our thinking is as a result of our particular culture and circumstances. History enables us to stand back and see our circumstances from a wider perspective, and better recognise that as a member of some ethnic group we have inherited the views of that group and we regard others in particular and biased ways. People from other nations are not different to us in any physiological sense, but they simply have a different history which leads them to think in a particular way and in a way we ourselves would think if we had been born into that history. We are who we are by chance and they are who they are by chance: now lets work together on solving the problems we mutually face. History helps us appreciate that our present situation is neither natural nor inevitable and that we consequently have many more possibilities before us than we imagine. It helps open our minds to an appreciation of the many different viewpoints that different people have and thus gives us a better understanding of why the world is as it is; enabling us to interact with it in a more realistic and pragmatic manner. History widens our horizons and provides us with a topic we can communicate to others about. History is fascinating. Having an interest in history brings an extra dimension to our lives. If you enjoy stories, history is pretty much the most interesting story you could read. And if you find a particular part of history interesting there is a continuing detailed story for you to follow up on. 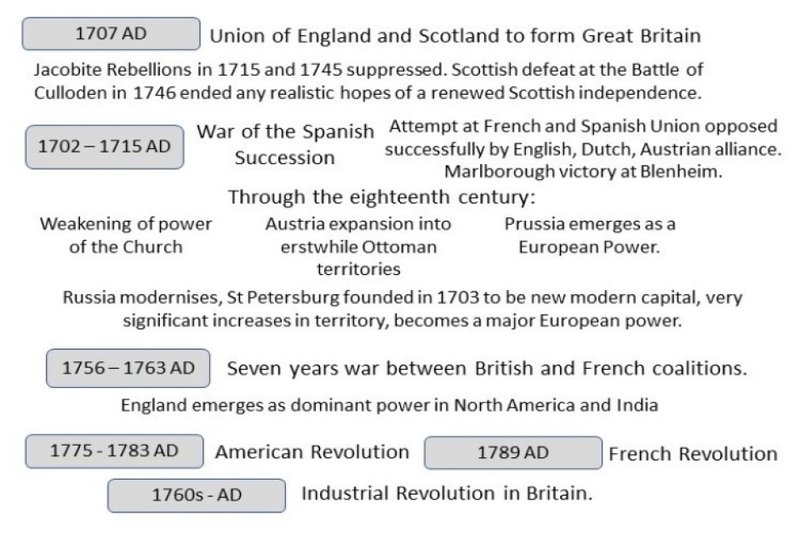 The following scroller is a brief run through major periods of history or the history of certain areas of the world now occupied by countries. 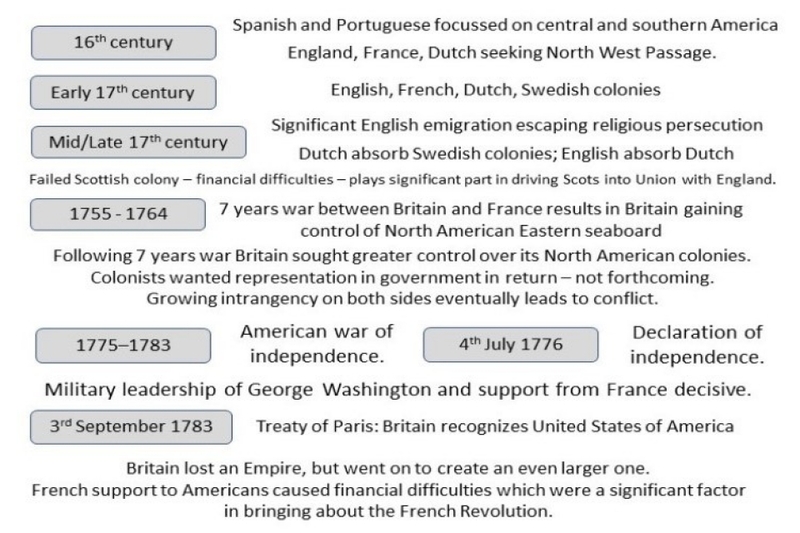 The following scroller provides a few snippets from history, some of which I hope you find interesting. The recorded history of our direct Homo Sapiens ancestors covers only about 3% of the time we have been walking the earth. The deliberate fermenting of grain to create alcoholic drinks dates back to before the emergence of civilization, and may even have been the initial motivation for the domestication of plants. The first person in history whose name is known is Kushim, an accountant in Mesopotamia in about 3,200 BC. Servants were smeared with honey in order to attract flies away from the pharaoh. Athenian citizens were encouraged to participate in politics, and the term ‘idiot’ was used for someone who did not do so. The Romans divided the day into 24 hours. However there were always 12 hours of daylight and 12 hours of darkness, and thus the length of an hour varied considerably through the year. The Chinese invented ice-cream in about 2000 BC with a mixture of soft milk, rice and snow. Since the late 7th century AD, the Naikū shrine in Japan has been dismantled and rebuilt every 20 years as part of the Shinto belief of death and renewal of nature. In the 14th century the Mali Empire was one of the richest in the world thanks to Gold mining on a vast scale. There are reports of a Mali fleet having reached the Americas in 1311, and in 1324 AD, a Malian ruler, Mansa Musa, brought so much Gold with him on a pilgrimage to Mecca that his visit resulted in the collapse of gold prices in Egypt and Arabia. The fall of Constantinople led to many Greek scholars fleeing West, primarily to the Italian city states, taking with them books and manuscripts which were then translated into Latin and which played a significant role in the developments of the Renaissance. Ibn al-Haytham, born in Basra about 965 AD but spent most of his life in Cairo, was arguably the greatest physicists in the 2000 years between Archimedes and Newton. He applied the scientific method some 200 years before it became the basis of renaissance science. He was the first to explain that vision occurs when light bounces off an object and into one's eyes. Included amongst the victims of the Mongols was a relatively small Islamic sect known as the Assassins based at Alamut in what is now Iran. The Assassins were highly trained intelligent killers, masters of disguise, used for political ends, who made the mistake of targeting the Great Khan of the Mongols. The potato originated in South America and was first brought across to Europe in about 1540. The introduction of the potato was key to enabling the growth in European population and urbanization in the 18th and 19th centuries. On 16 Feb 1568 the entire population of the Netherlands was condemned to death by the Inquisition for heresy. 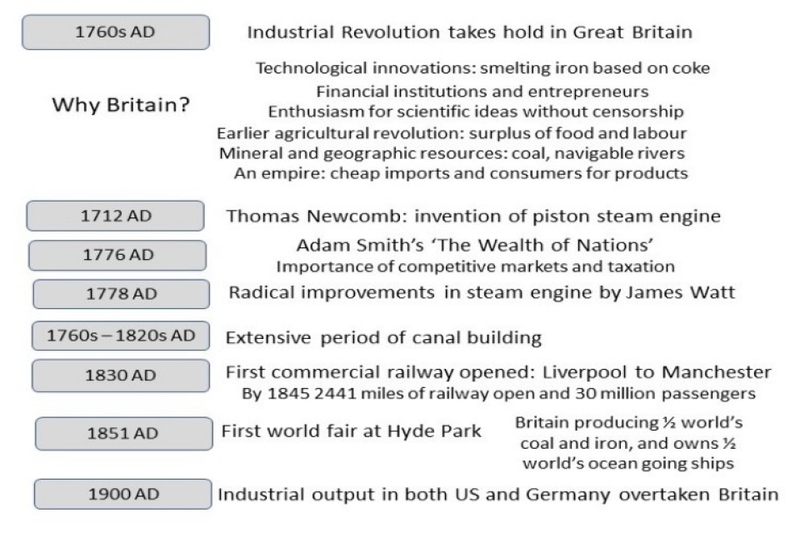 The Industrial Revolution enabled those powers that had industrialised to impose their will upon those that hadn’t. In 1750 China and India were two of the richest countries in the world. By 1900 they were two of the poorest. A pandemic of a deadly influence virus killed upwards of 50 million, about 5% of the world’s population, in 1918 – 1919. It is known as the Spanish Flu since reporting restrictions at the end of the WWI meant that in Europe it was only in neutral Spain that it was openly reported. 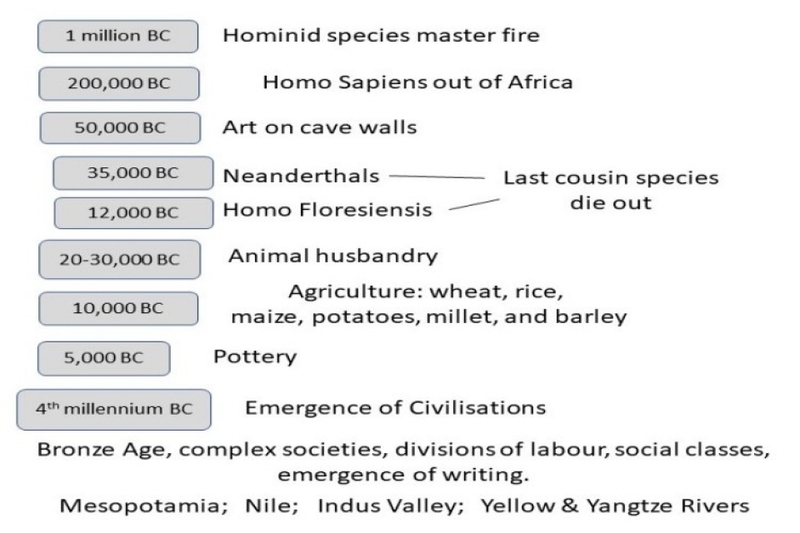 Using modern labels to describe the past can be highly misleading. When speaking of historical events we often use modern country terms. We talk of France, or China, or India. This is a necessary shorthand to let the reader know where we are taking about without putting him or her off by being more precise. However this also gives a false impression of the past which many readers will misunderstand. 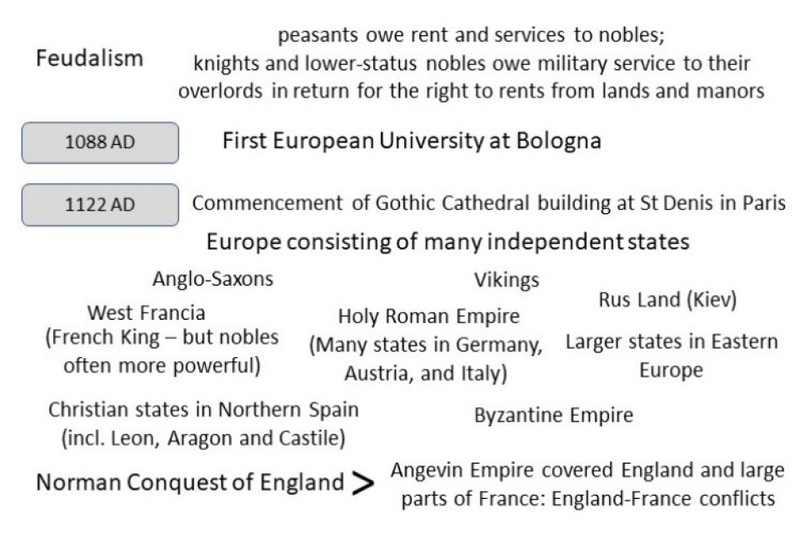 Thus we talk of England in the Roman times and imagine our ancestors living there. However the people we now are may or may not be strongly related to those from some particular past point in the history of the land we live in. For example the ancestry of those living in the UK is about 37 per cent Anglo Saxon, Germanic invaders from about 500 AD, 22 per cent Celtic, invaders from about 500 BC, 20 percent Western mainland European, immigrants from various times over the last 1,000 or so years, and 10 per cent Scandinavian. Whilst we use these national terms to give the reader an appreciation of where in the world we are talking about, we need to be wary of thinking that our modern day nations and peoples have been around for thousands of years. They haven’t. Our modern day obsession with nations is a phenomena of only the past couple of hundred years. People three of four hundred years ago did not feel English, or French, or Russian, or Indian. Any sense of belonging they would have had would have either been to their local village or area, or possibly to some lord or local power figure. Whilst historical films will show a people ‘fighting for England’, at the time this would have meant nothing to them. Many people who look back at their history with national pride are in fact referring back to a people with whom they may have little or no direct genetic relationship. They may even be referring back to a people who their true genetic ancestors may have been responsible for exterminating. There is also an artificiality about other terms we use when referring to the past. 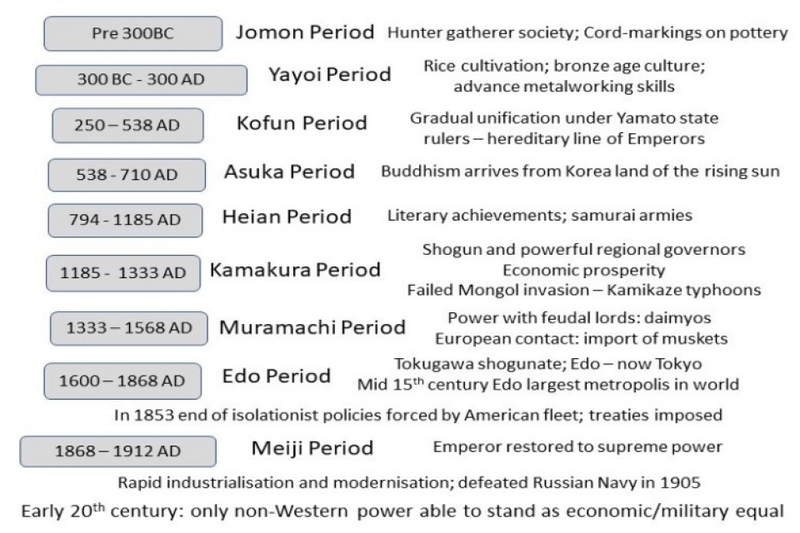 We refer to periods of history or to movements or to empires, but this is often merely a convenient terminology we use in the present to make sense of the past and not a terminology that would have been in use at the time or even have made any sense at the time. Nevertheless it is a useful and necessary means of providing us with a mental architecture that enables us to talk about the past. We should also be wary of applying modern day morality and sensibilities to the past. People in the past were physically and intellectually much the same as today, albeit without the benefits of modern day diets and learning. They were shaped by their environment in the same way as we are shaped by ours. We should not judge them by today’s standards. Whilst some people have no trouble with immediately recognizing what is meant by the 2nd millennium BC or the 15th century AD, others are not so sure. If you’re not so sure then read on. 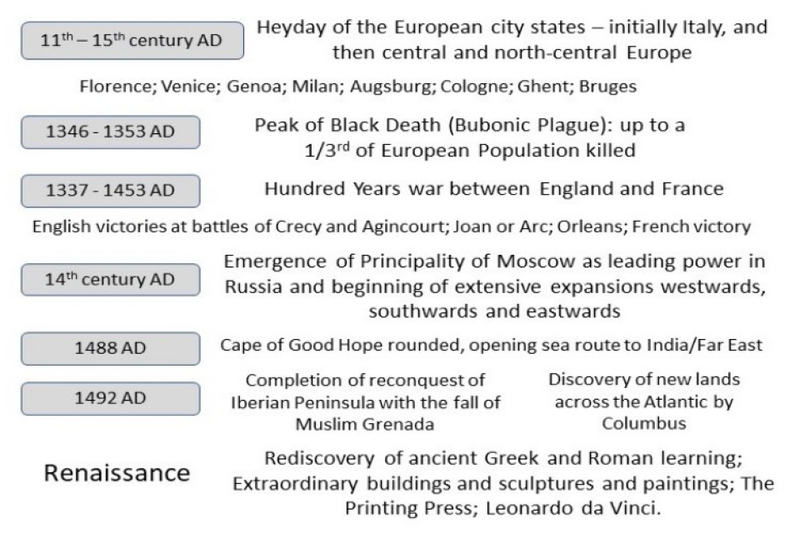 The first century AD was the period from 1 AD through to, and including 31st Dec 100 AD. Thus the first day of the 2nd century is 1st Jan 101 AD, and the 20th century ran from 1st Jan 1901 through to 31st Dec 2000. 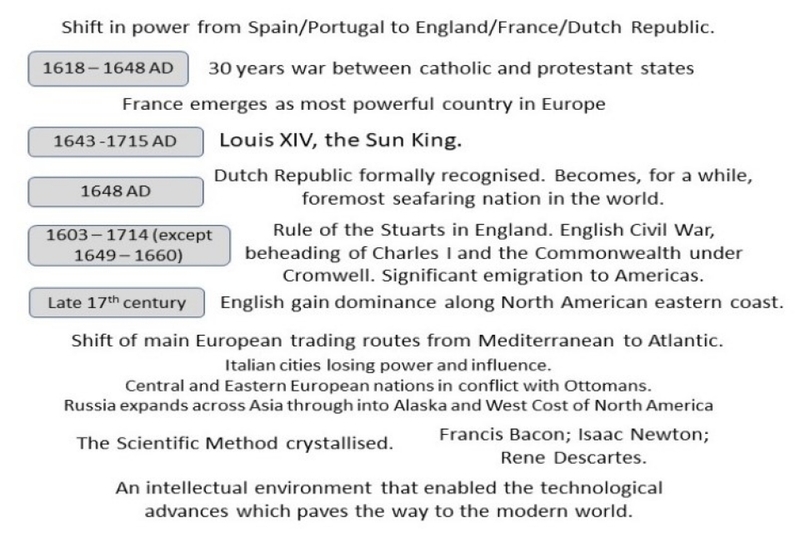 Thus most of the 15th century for example is the years beginning 14xx. 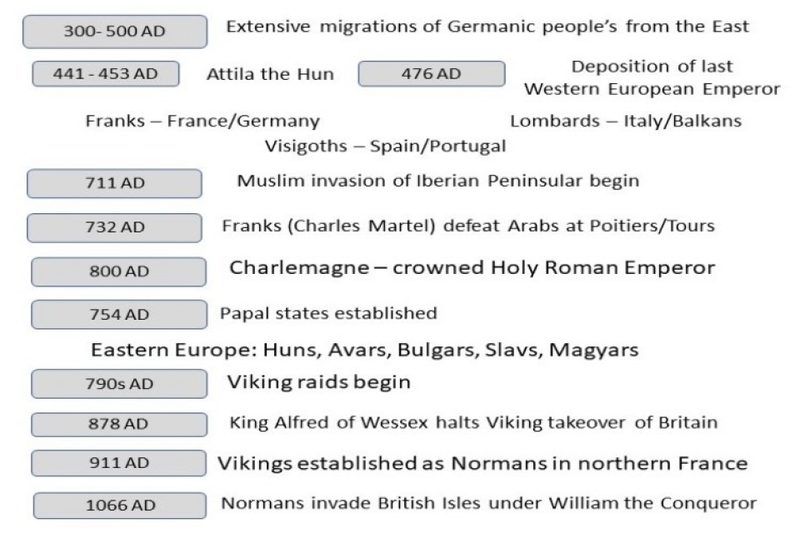 The first millennium AD consisted of the first 10 centuries AD, and thus ran from 1 AD through to 31st Dec 1000 AD. The second millennium AD thus ran from 1st Jan 1001 through to 31st Dec 2000 AD. The third millennium thus began on 1st Jan 2001 AD. 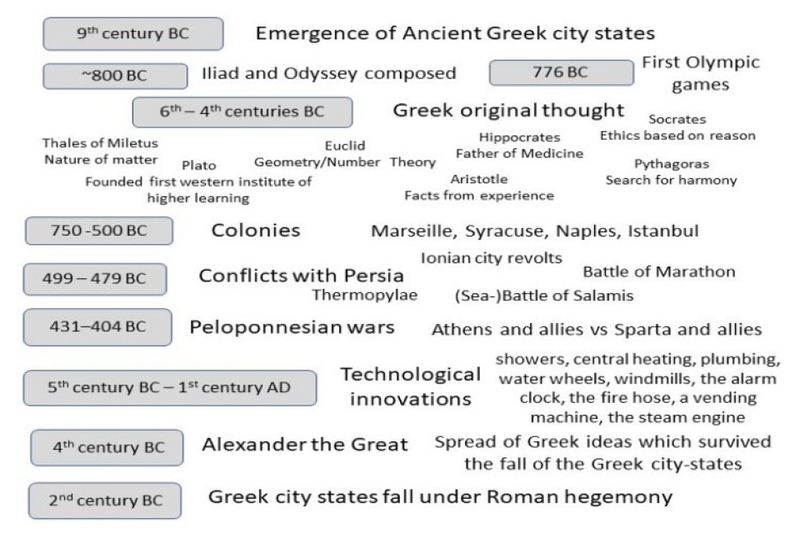 The first century BC was the period from 1st Jan 100 BC through to 31st Dec 1 BC. The 8th century BC thus ran from 1st Jan 800 through to 31st Dec 701 BC. The first millennium BC consists of the 10 centuries immediately preceding start of the Common Era, and thus runs from 1st Jan 1000 BC through to 31st Dec 1 BC. Thus the 4th millennium BC runs from 1st Jan 4000 BC through to 31st Dec 3001 BC. For background information it is worth keeping in mind that the world has not always been populated by today’s large populations. 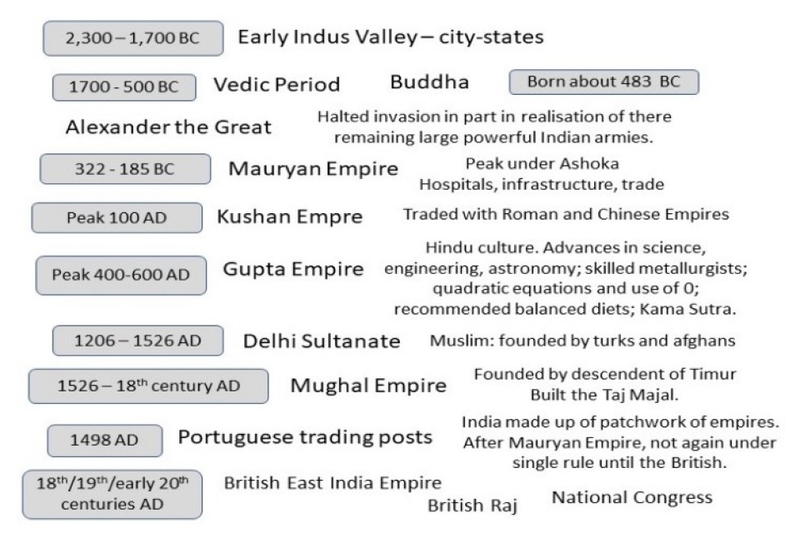 Around 1,000 BC, when we had major civilizations in the Middle East, in China, and in India, the total world population was of the order 50 million. That is smaller than the populations of many of today’s countries, including Britain. 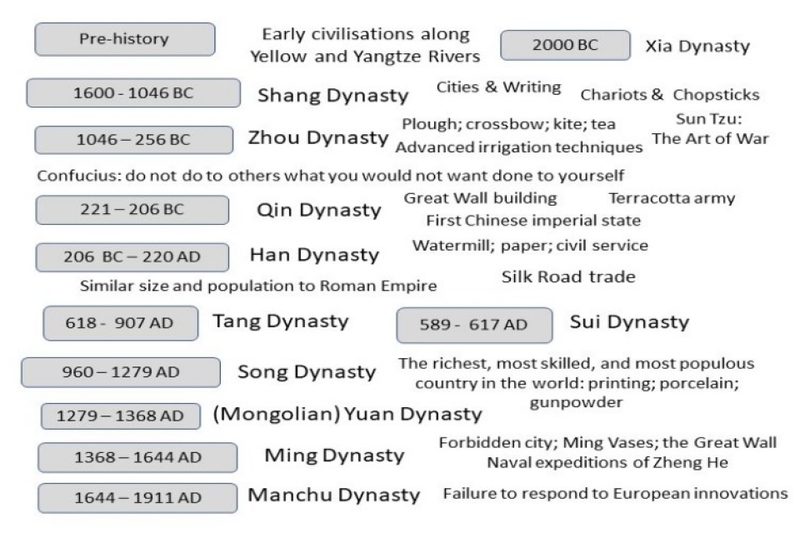 At the time of Christ, when there were major Roman and Chinese Empires, the world population was about 200 million, less than that of Brazil today. The population of the whole of the Roman Empire at its peak was less than the population of Italy today. Through the 1st millennium AD the population grew little, lots of diseases and wars about, and by 1000 AD it stood at about 250 million. Through the 2nd millennium it steadily crept up, and in 1804 it hit a billion and by 1927 2 billion. It is also worth keeping in mind that until relatively recently about 95% of humans were peasants who rose each morning to till the land. The extra they produced fed the tiny minority of elites – kings, government officials, soldiers, merchants, priests, artists, and thinkers – that worked away from the fields and occasionally get a mention in the history books. History is something that a small number of people have been doing whilst the vast majority of our ancestors were ploughing the fields and carrying water buckets. Which millennium are the following years in? a. 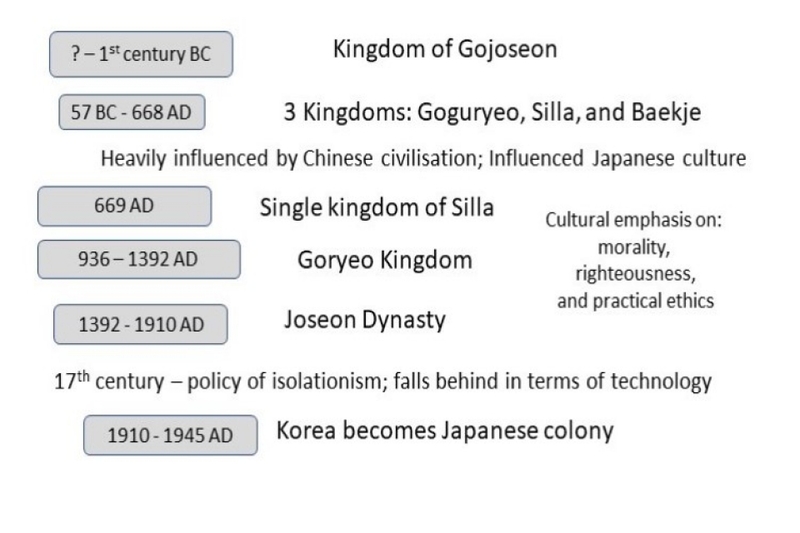 The year 23,322 BC would be in the 24th millennium BC, though usage of the term millennium is usually in the context of human history, and it is very rare we would refer to years this far in the past in terms of specific years or millennium. b. 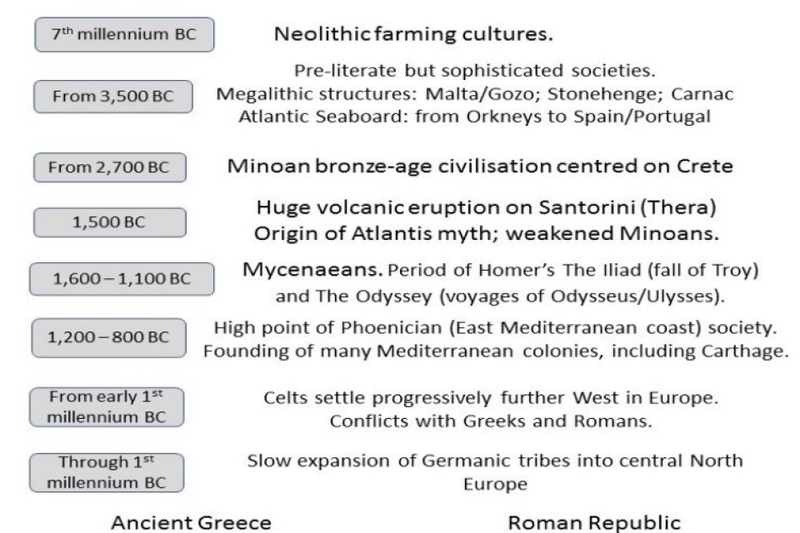 The year 1,231 BC is in the 2nd millennium BC. c. The year 992 AD is in the 1st millennium AD, or often just described as the first millennium. d. The year 1001 AD is in first year of the 2nd millennium AD. 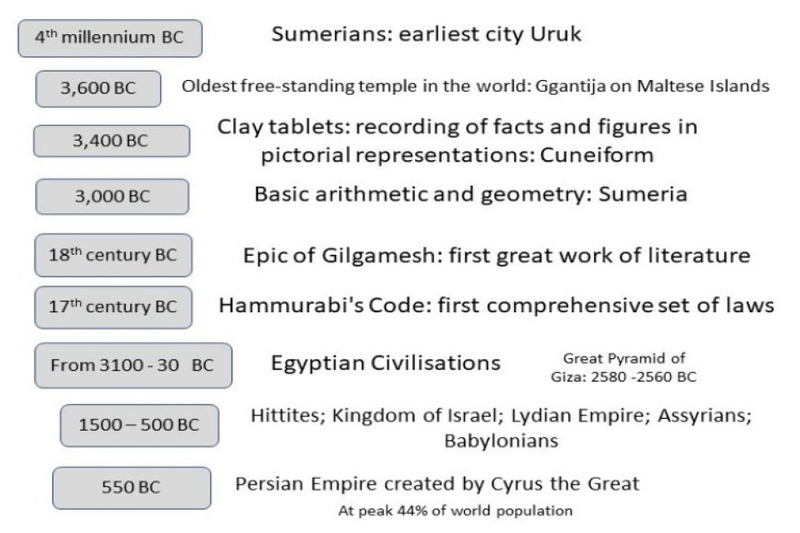 e. The year 2000 BC is in the first year of the 2nd millennium BC. f. The year 2000 AD is in the last year of the 2nd millennium AD. g. The year 0 did not exist. 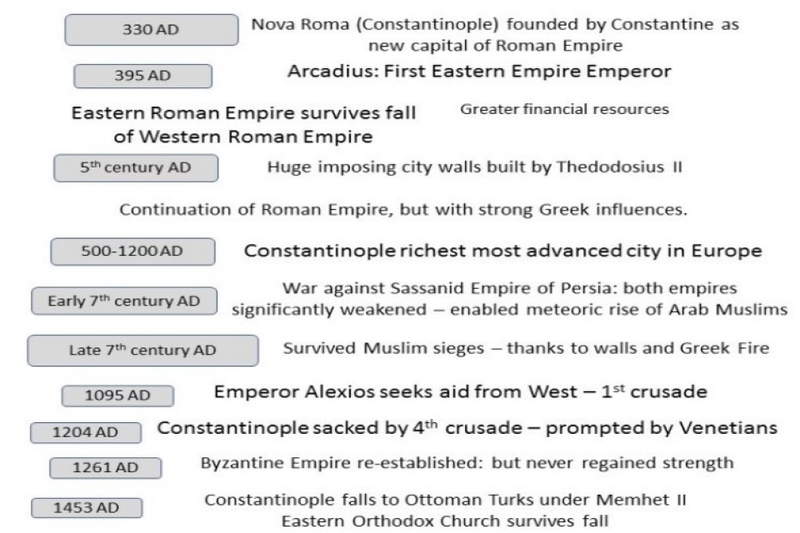 The year 1 BC was followed by the year 1 AD. Note that should you consider 2000 AD as being the beginning of the 3rd millennium, then fair enough. 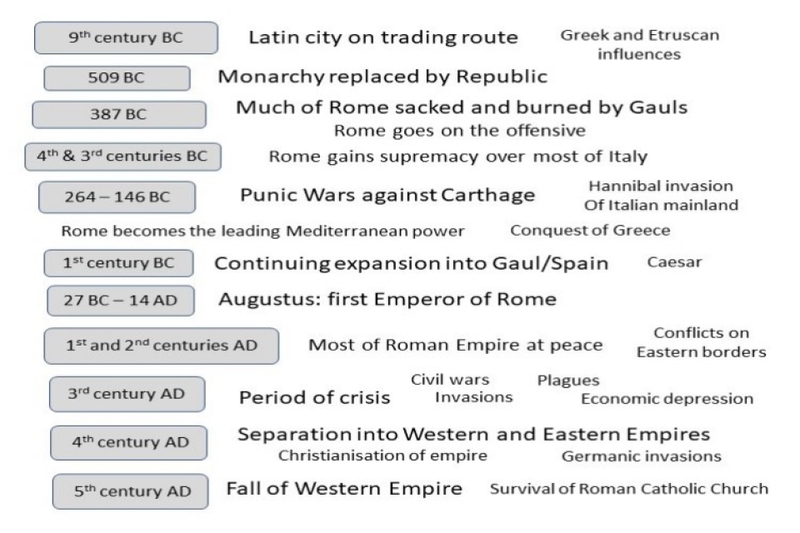 It is a different viewpoint though not correct in that the first year AD was 1 AD. Which century are the following years in? g. The year 2000 AD is in the 20th century AD, despite the 1st of January 2000AD being widely celebrated as the start of the 21st century. c. The last of the Neanderthals, died out about 30,000 years ago. It is possible that another cousin species survived later than this in the South Asian Island area, though this is not, at the time of writing, an established fact. Other than in Mesopotamia, what were the three other regions of the world that advanced cultures are believed to have first developed? Name, if you can, both the River area and the modern day country. Carthage and Cadiz were founded by the Phoenicians. Syracuse and Marseille were founded by the Greeks. Which philosophers were near contemporaries in the 6th Century BC? Alexander the Great, the Mecedonian, created a brief Empire which stretched from Greece and Egypt to India. How old was he when he died? Which Roman Emperor was ruling at the time of the birth of Jesus Christ? Which Roman Emperor, in the 3rd century AD, divided the Empire into two, which major city was named after him, and what was the name of the Empire which resulted from the split and lasted through until the 15th century AD. 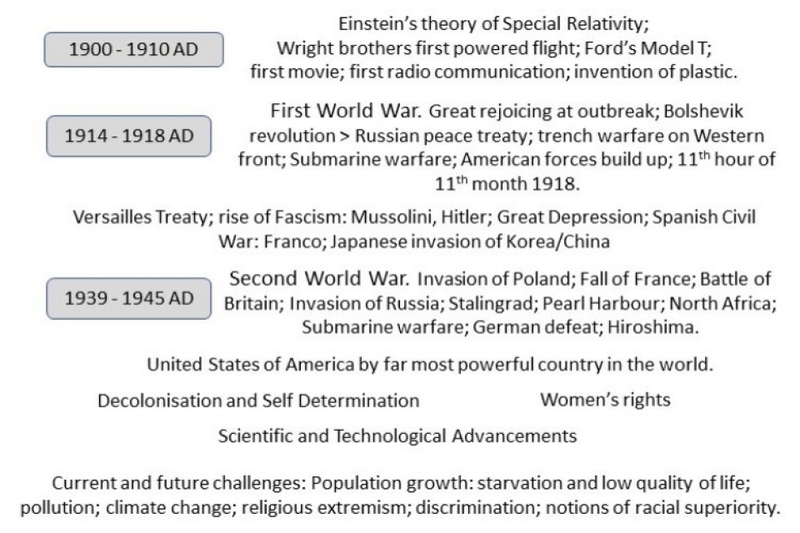 Order the following chronologically from earliest to most recent in terms of what is recognised as their heydays. Who was crowned Holy Roman Emperor by Pope Leo III on Christmas Day 800 AD? Ankara. The other three are all the same city at different times in its history. Who was the grandson of Genghis Khan who became emperor of China and the founder of the Yuan dynasty, and who Marco Polo is reputed to have met? 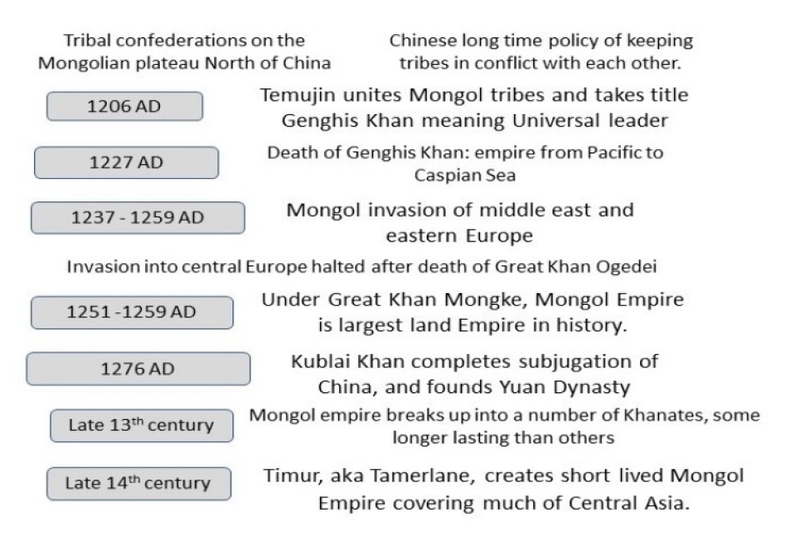 In the 13th century the Mongols under Kublai Khan attempted an invasion of Japan. The Japanese were saved in part by the Samurai, and in part by a Kamikaze. What was the Kamikaze? Kamikaze, meaning divine wind, was reference to typhoons which on two occasions destroyed much of the Mongol fleet. Which European country was the first to establish trading posts on the coast of India following the rounding of The Cape of Good Hope? • Extensive network of roads and rest houses connecting every town in the empire. Shortly after the coming of the Europeans to America, two major American civilisations fell, one to Cortes, and one to Pissaro. What were they? 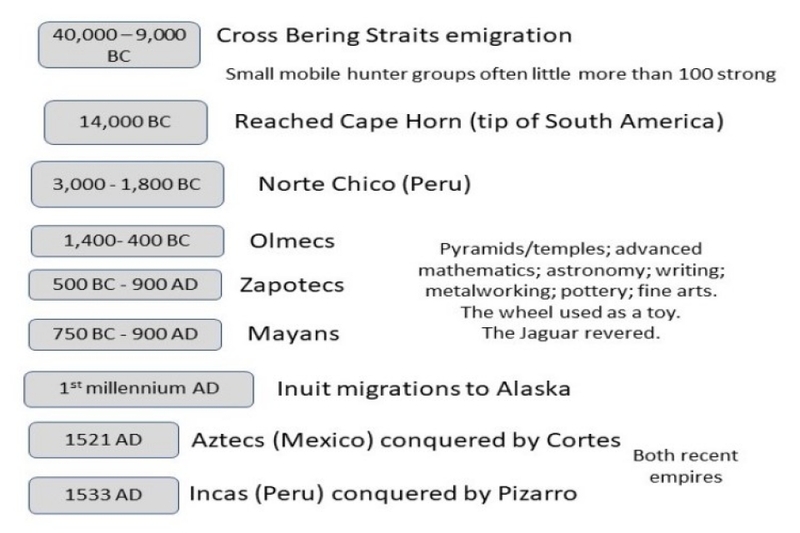 The Aztecs fell to Cortes, and the Incas to Pissarro. In the early 20th century there was only one non-European/American country which could stand as an economic and military equal of the European/American nations. Which country? 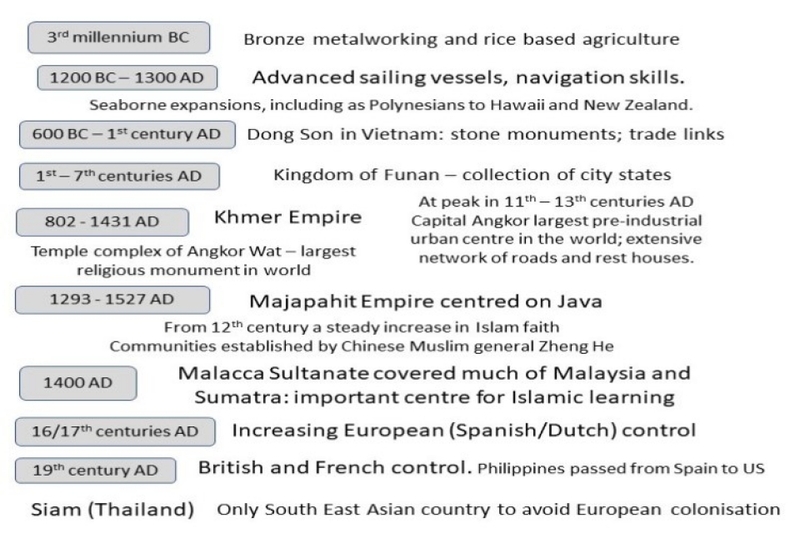 Which was the only country in South East Asia to avoid European colonisation? Siam, modern day Thailand. Rather than attempt to resist European influences, the Siamese Kings astutely built diplomatic ties with Europeans and Americans and undertook modernising reforms. 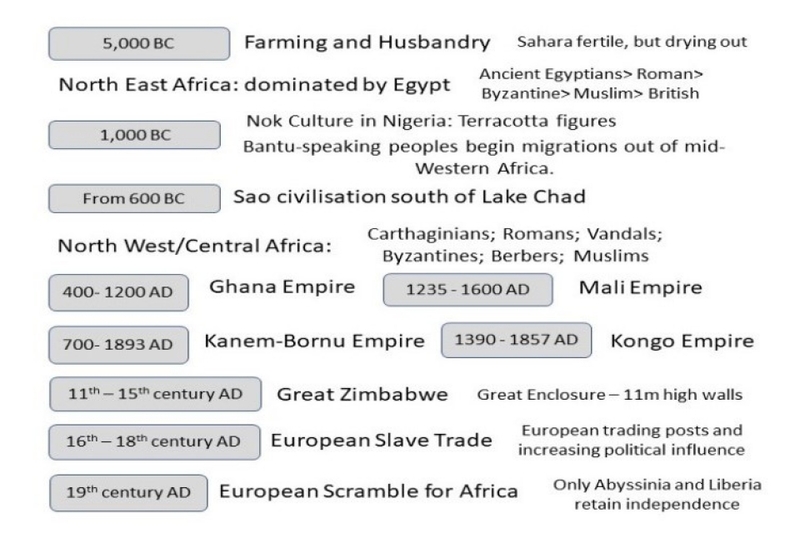 Which were the only two African countries to avoid European colonisation? Abyssinia, modern day Ethiopia, and Liberia. Albeit Liberia had in fact been founded by United States citizens and remained, during The Scramble for Africa, under an American sphere of influence. When the (i) took control of Jerusalem, they massacred the population, with little consideration of their religion. a. 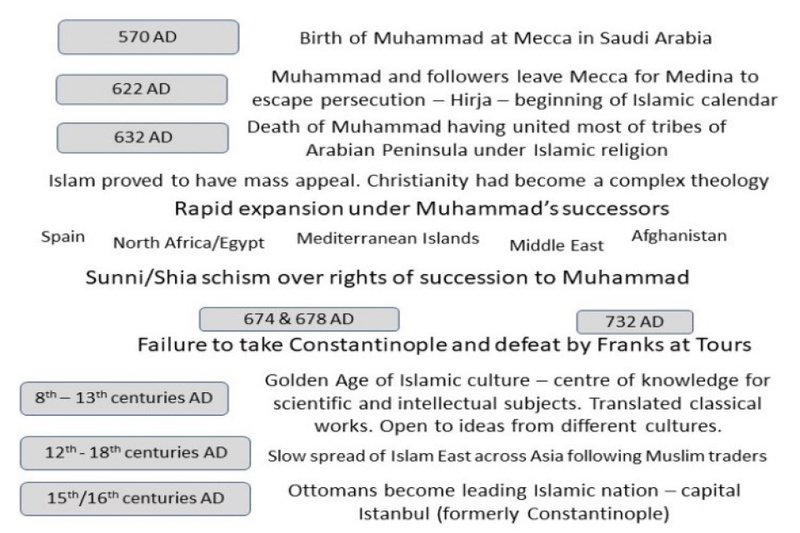 The Muslims under Saladin. b. The Christians under, amongst others, King Richard the Lionheart. (i) b. The Christian’s massacred any they found in Jerusalem, including fellow Christians and Jews. (ii) a. 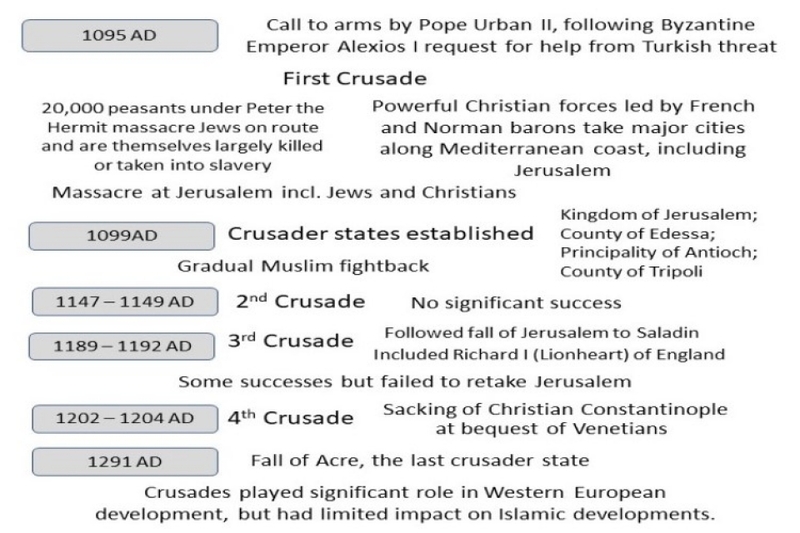 The Muslim takeover of Jerusalem in 1187 was relatively peaceful, by the standards of the day, and certainly in comparison to the Christian takeover of 1099. 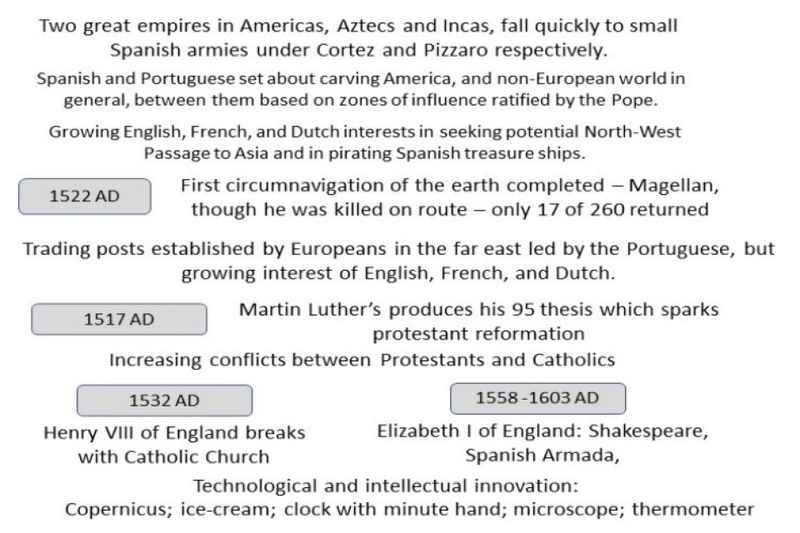 The spread of Protestant ideas was enabled by, and probably would not have happened without, a particular technological innovation. Which one? The Knights Hospitaller of Saint John were one of the religious military orders that were founded in support of travellers to the crusader states established in the Middle East. 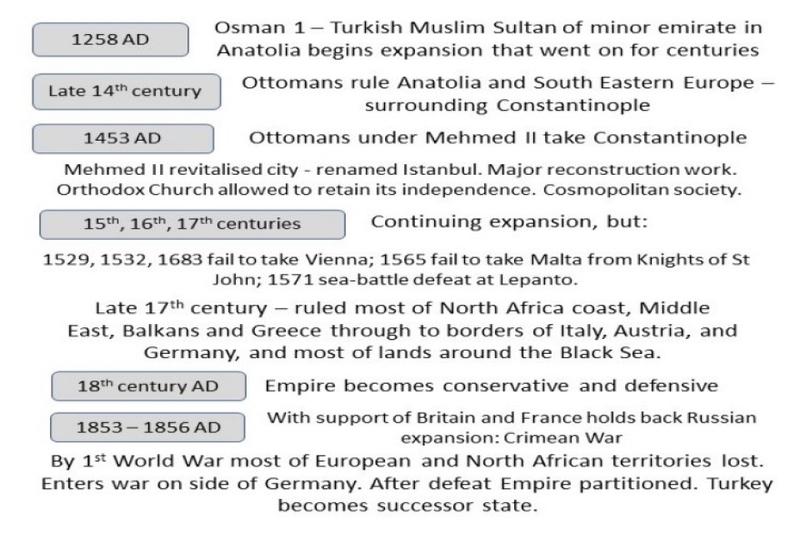 With the reconquest of the middle east by the Muslims they were forced out initially to Cyprus and then Rhodes, where the ruled for some 200 years. When forced out from Rhodes where did they then settle, through till the end of the 18th century? Malta, where they ruled until being ousted by Napoleon in 1798. The Maltese however were not too keen on the French and turned to the British for help. The last major outbreak of the Black Death in Europe, to date, was in 1720. Where did it occur? Marseille, where about 100,000 were killed in the city and its environs. What is termed the Scientific Method emerged in the 17th century with the works of persons such as Francis Bacon, Rene Descartes and Isaac Newton. What, in simplistic terms, is meant by The Scientific Method? In simplistic terms the Scientific Method is ensuring that theories are based on measurable evidence, with observation and experimentation used to determine new knowledge and to derive or refine our understanding about the world. 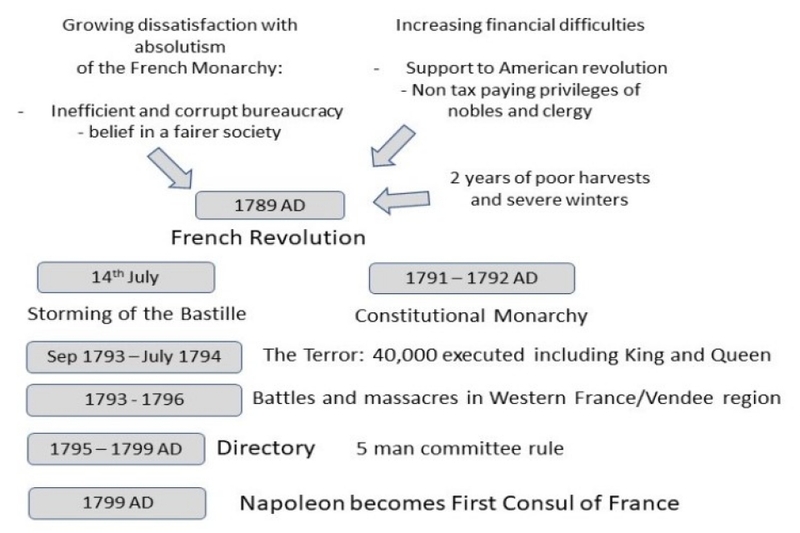 Three major revolutions occurred in the second half of the 18th century which were to have a profound effect on the world. What were they? a. It led to more American deaths than did the first world war and the second world war combined. b. It was triggered by Abraham Lincoln’s stated intent to ban slavery from the Southern states. c. Technologies applied included early submarines, aircraft, and tanks. 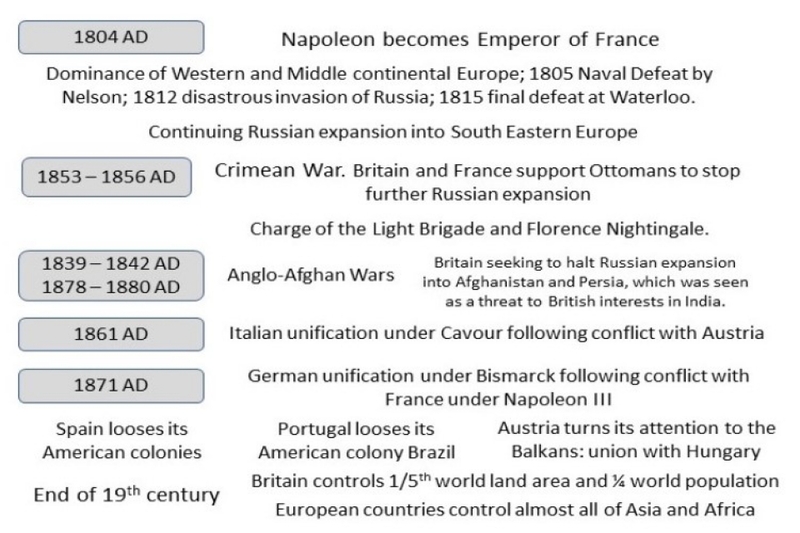 d. The two sides were equally matched and the North’s victory was largely due to superior military leaders. e. Armed conflict began when the North launched an attack on the Confederacy. Only a. is true. 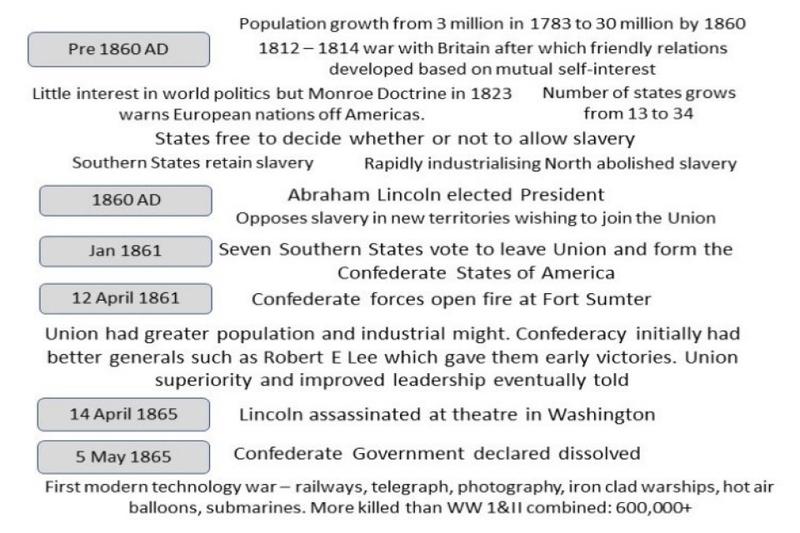 Lincoln had not threatened to ban slavery from the Southern States, though he had stated new states to the Union could only do so without slavery. Technologies did include early submarines, but not aircraft or tanks. The North had an overwhelming superiority and it was only the early superiority of the South’s leaders that meant the South wasn’t quickly overwhelmed. It was the South that started the armed conflict. 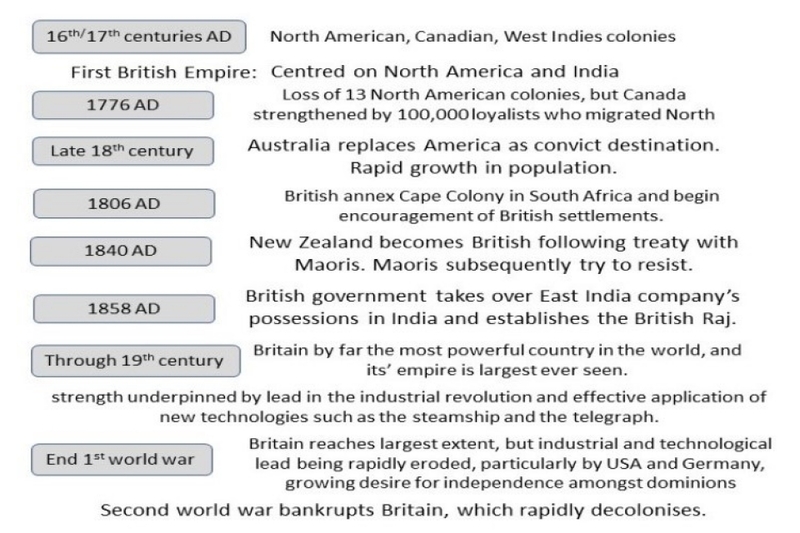 Identify some of the contrasts between the beginning and the end of the 20th century. At the start of the 20th century there was a widespread belief that we more or less understood the universe, and that the last few details of scientific knowledge would soon be filled in. However the emergence of ideas such as relatively and quantum physics profoundly changed our models of the physical world and we rapidly came to realize that the universe was far more complex than we had previously believed. The 20th century began with horses and simple automobiles and ended with high-speed rail, nuclear submarines, global commercial air travel and the space shuttle. In 1901 Marconi established the first radio communication across the Atlantic; by the end of the 20th century we had the World Wide Web. Global life expectancy increased from 35 years at the beginning of the century to 65 years by its end, though there continued to huge variations around the world.